Mala (Lagorchestes hirsutus) are small finely built hare-wallabies with reddish brown fur. Mala are nocturnal. 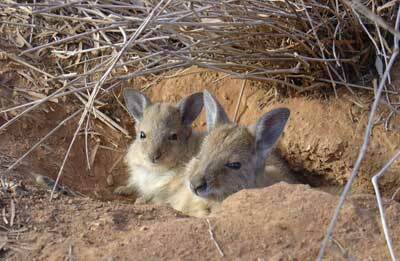 In the cooler part of the year they shelter by day in a shallow digs in or under a spinifex hummock; during the intense heat of summer, a burrow up to 70cm deep is dug under shrubs. Once widespread and common in the sand country of the Northern Territory, South Australia and Western Australia but are now extinct in the wild. Mala are extinct in the wild. They survive in captivity and on three offshore islands. Mala feed on seed heads of grasses at night, and the leaves of post-fire regenerating plants. Many factors are believed to have contributed to the mala's demise, including predation from feral cats and foxes, land clearing and the reduction of traditional Aboriginal burning practices. Mala grow to 35cm high and weigh between one to 2kg. Females are slightly larger than males. Mala breed after rainfall producing one young that remains in the pouch for only a few weeks. 'Lagorchestes hirsutus' means shaggy dancing hare. When startled they do a zig zag erratic hop from side to side with their legs forced outward and to the side. For Aboriginal people, the mala or hare wallaby people are important ancestral beings. For tens of thousands of years, the mala have watched over them from rocks and caves and walls, guiding them on their relationships with people, plants and animals, rules for living and caring for country. Mala Law, is central to their living culture and celebrated in story, song, dance and ceremony.